Storage Wars is a television show in the Reality genre starring Barry Weiss, Dave Hester, and Darrell Sheets. The tv show first appeared on air on 2010-12-01. Our users found the overall impression of this television show to be Educational. 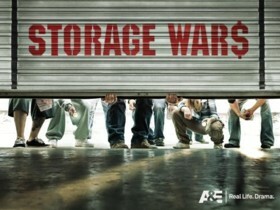 The tv show's official site can be found at www.aetv.com/storage-wars. Awesome show that is both funny and educational with a great cast. This show airs on A&E and offers a unique take on a reality show. In this show you see a unique cast of characters (Barry the collector, Dave the store owner and big wig. Darryl the hunter and Jarrod and his wife Brandi the thrift store owners) buy lockers and storage units each week. Now you may think that this would make a dull show, but interestingly enough it is actually quite entertaining. The interaction of the various characters is funny and I really find the cast makes this show fun...even more than the goodies that they find. Each week you get to watch as the cast find some hidden treasures. One week Darryl found some vases worth 3000 and another week Jarrod found a toy collection worth thousands. I really find the combination of cast, setting and storage units quite interesting and the production value seems really good. Overall this show is fantastic and I recommend everyone to give it a watch.